AFTER receiving her O-level results in 2007, Miss Florence Wong (above) had to make a choice. 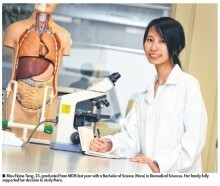 Miss Wong, 24, had always wanted a career in the life sciences, as she liked biology in school. She eventually opted to pursue her dream at the Management Development Institute of Singapore (MDIS). 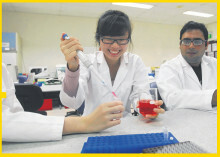 “I liked the structure of the Life Sciences programme at MDIS. The full campus layout, which included a good library essential for Life Sciences students, and the good feedback about the lecturers helped me make MDIS my choice,” said the medical information and drug safety specialist at Mundipharma Pte Ltd, a pharmaceutical firm with a global presence spanning the UK, Germany, Switzerland, Asia-Pacific and recently Latin America. The firm deals in many kinds of drugs, including painkillers. Miss Wong has been in the job for just over a year. After enrolling in MDIS in 2007, Miss Wong did a Foundation Certificate in the Biomedical Sciences programme awarded by MDIS to prepare her for the degree programme. After getting the Foundation Certificate, she enrolled for the Bachelor of Science (Honours) in Biomedical Sciences programme in 2008. The degree is awarded by the University of Bradford, UK. Miss Wong was initially a full-time student but later became a part-time one. “I loved examining tissue and cell samples through the microscope, so the specialisation was suitable for me. “I also had to read many scientific journals and prepare my own lab reports after every experiment,” said Miss Wong, who graduated from the programme in December last year. Studying at MDIS has helped Miss Wong do her work better. The reading habit she picked up during her degree studies now comes in handy for her as she pores through scientific and trade journals in her job. She uses that information directly in her job or as part of the information she passes to her sales colleagues. Source:[The New Paper 31072013] © Singapore Press Holdings Limited.